As I dosed off sometime in the middle of the night in a dumpy motel after a long day of traveling and visiting relatives, the sleeping soundtrack my man had put on struck me as a brilliant piece of music. It wasn't until the next morning, when, as if realizing what I had dreamed, I said, "You put on some really great music last night. Who was that?" "Yeah, it was good wasn't it? That's The Low Anthem." Yes. It was good! It was an aromatic mix of Ray LaMontagne and Elbow, with a touch of Ben Harper thrown in for the Bam! I listened to What The Crow Brings from beginning to end three times when we got home before I realized that I was listening to their debut album, released in 2007. 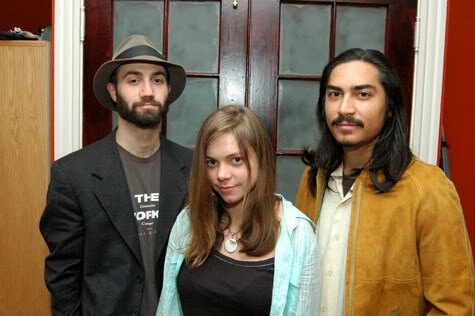 It turns out the band, a trio of instrumentalists from Rhode Island and together since 2006, recorded that album in their apartments and fully self-produced and distributed it. They hand-painted and hand-numbered the 600 albums they released. Pretty awesome. Their sophomore album, Oh, My God, Charlie Darwin was also self-recorded, only this time they hand-painted and hand-numbered 2000 albums for release. They toured a bit to promote the album, and somehow found themselves in the UK where they signed record deals and got their album re-released. The Low Anthem moved on from there to play several US festivals and European shows, add a member, play David Letterman, lose a member, add a member, and occupy an abandoned pasta sauce factory to record their third album, Smart Flesh. Oh, and PS, Mike Mogis mixed the album. Using the big, empty space at the factory added to the sounds on this album. In fact, the band refers to the space itself as an instrument they used. 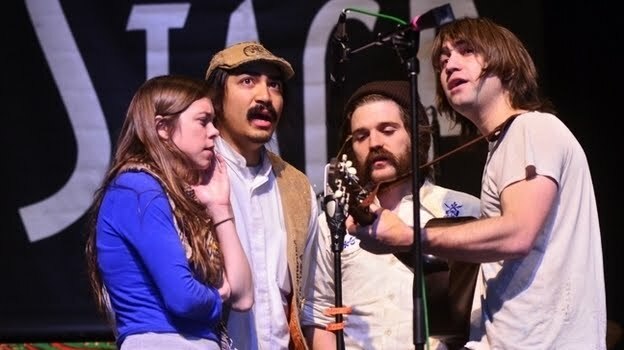 Add that to the World-War-II-era pump organ, dulcimer, clarinet, trumpet, fiddle, musical saw, and a handful of other instruments used by the band. They carry all of these instruments on the road with them, and will sometimes have to borrow replacements when things like a bass amp or an upright bass break! Click to Enjoy The Low Anthem - Hey, All You Hippies! "Hey, All You Hippies!" is a great anthem collecting various observations of the under-achieving, over-entitled soft-palmed class of disaffected under-30 college grads and hipsters swarming our streets and coffee shops of late. Wait. Maybe that's not the intent of the song. But it's what I hear. The song that enchanted me was the first track off the first album. And on the second, I couldn't help but fall to the charms of the Harper-esque "Champion Angel." Enjoy this bonus. And make sure to find them live. This band takes the time to make sure the sound they deliver to you is right and good. They're in the cold and wet European interior right now, but come January they will be back in the states with a Portland show on the 16th, some Pac-No borderhopping throughout the month, and on to Minneapolis in February. Check the schedule here. They're touring with City and Colour, another inALLCAPS favorite.